Samford University graduates earn more than any other Alabama four-year institution, according to the latest report issued by the U.S. Department of Education. 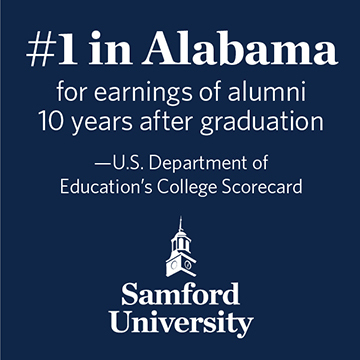 Samford graduates were averaging $45,800 per year 10 years after graduation. The U.S. Department of Education’s scorecard includes information on the median earnings of former students of Alabama colleges and universities. The numbers are based on average yearly wages 10 years after the students entered the school. Samford’s graduation rate also is the highest in Alabama according to the Department of Education information.